Buffalo NY, October 2nd 2015 Dealer Simplified LLC, a Buffalo-based provider of online vehicle auctioning systems for automotive dealers, announced today the company has signed it’s 1,000th registered wholesale buyer on it’s Auction Simplified platform. Dealer Simplified’s VP and Co-Founder Phil Gates made the announcement. 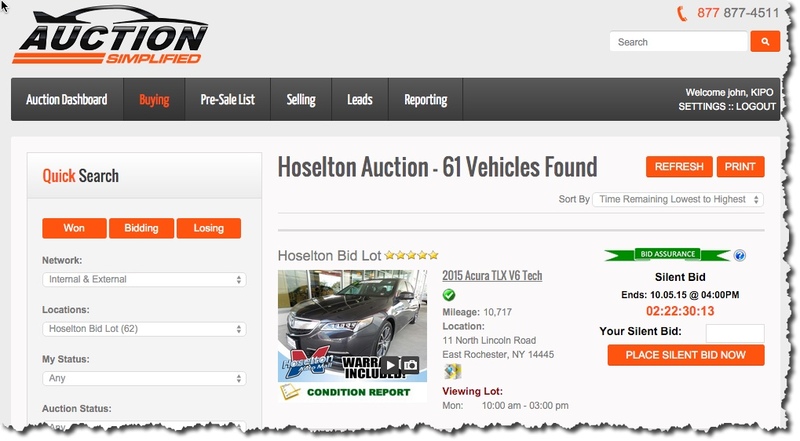 Founded in Western New York last year, Auction Simplified leverages mobile technology to enable automotive dealers to offer real-time auctions on vehicles as well as auction vehicles to other dealers directly from their dealership. The company has grown rapidly in the North East and has been expanding strategically in the United States. Using Auction Simplified gives dealers an advantage because it allows them the ability to hold their own auction online and avoid the high costs of third party auction houses. The company held its first private Beta with the Gault Auto Group in October 2014 and officially launched the product in April of 2015. Now they have auctions running in NY, NJ, PA and AZ including 2 Dealer Groups on the Automotive News top 150. “We are seeing greater net returns in wholesale. The wholesale turn time has greatly decreased as we are selling over 90% in each sale.” said Chris Silvers of Elm Chevrolet. Auction Simplified is expanding its footprint in the dealer-to-dealer market across the United States. Currently doing business with more than 1,000 Independent car dealers throughout the North East and Arizona.